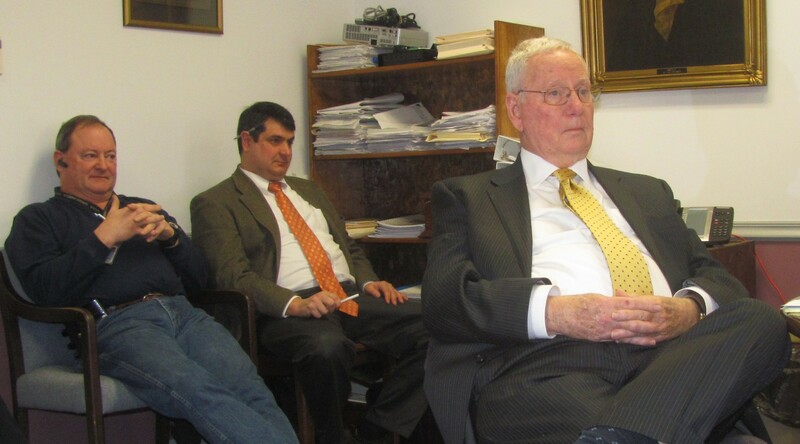 Wyoming County Solicitor Jim Davis (top, right) listens intently to citizens speaking at the Dec. 30 meeting of the Wyoming County Commissioners. Tuesday was the attorney’s last official day as County Solicitor. The vacated seat of Davis (above) will be filled in 2015 by Atty. Paul Litwin, seated (top, center) next to county EMA Director Gene Dziak. 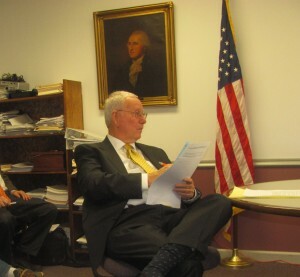 Retiring Wyoming County Solicitor Jim Davis didn’t squirm in his seat during the heated public debate that ruled the first half of the December 30 meeting of the county commissioners. He relished in it. Davis’s demeanor remained remarkably steady during his last official meeting as legal referee for the three-member board and the county, despite a barrage of questions and largely negative commentary being heaped on the commissioners by some 40 citizens in attendance. While it seemed that there were voices coming from everywhere at once, Davis absorbed the discourse with aplomb and spoke only when someone’s rhetoric crossed the line of legality, which included misinterpretations or misguided assumptions of the county’s legal responsibilities. As tempers at the meeting flared and advocates for an independent air quality study began to openly blame the commissioners for “letting” the gas industry “invade” the county, Davis’s voice calmly but assuredly broke through the chatter to back up Commissioner Tom Henry’s response that there was no stopping the gas industry from coming in. In Henry’s acknowledgement of Davis’s departure after serving under two administrations at the courthouse, the Chairman praised Davis for his honesty, his integrity, and the ease and trust in working with the attorney that the three commissioners had shared. He made final references to the emotional exchange earlier in the meeting as the epitome of what he finds positive about open government and transparency. “I guarantee that they have agonized over this for a long time,” he said of the commissioners and their mixed and reserved opinions about a proposed DEP/EPA study versus the independent emissions audit. Wyoming County Commissioners (from left) Ron Williams, Tom Henry (second from right) and Judy Mead (right) congratulate Atty. 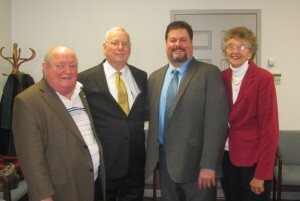 Jim Davis on his retirement as County Solicitor at their Dec. 30 meeting. To learn more about what happened at the commissioners meeting, click on http://www.endlessmtnlifestyles.com/?p=3103.